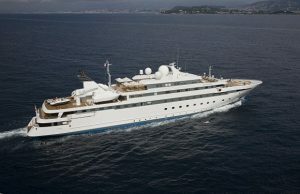 The 90m/295ft luxury yacht ‘Lauren L’ is fresh from a refit of her main salon, master suite and VIP staterooms. Thanks to Mokka Design and Elysee Yachts Ltd, Lauren L now features brighter, more contemporary interior spaces, which retain their grand, stately aura. In the main salon, navy blue and gold settees have been replaced by powder blue sofas and armchairs, and light blue and cream flooring has taken the place of dated navy and gold patterned carpets. Gone too are the matching curtains. Instead roll-up blinds frame the windows, which creates a more modern look as well as allowing more natural light to flow into the salon. Meanwhile, the master stateroom has been spruced up with new upholstery. Cream damask-patterned curtains match the luxe bed linen, and the carpets have been refreshed. Powder blue armchairs are also new additions. 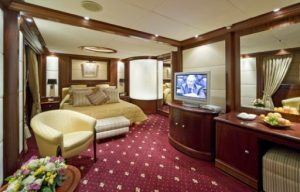 A huge transformation can be seen in the VIP cabin of charter yacht Lauren L. The carpet is no longer red and gold, but boasts soft blue and cream hues, and the gold bed linen has been replaced by an elegant cream option. The new look of these staterooms provides a much more peaceful, calming vibe and the corridors have also been re-vamped to adhere to this theme. The project took place in Athens, Greece, and was overseen by Titan Fleet Management. 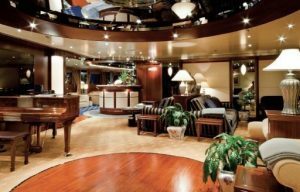 The next round of work will see an overhaul of the yacht’s dining room. Yacht Charter Fleet will keep you updated on the developments. 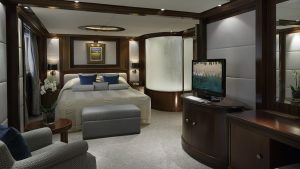 Alongside a master suite and VIP cabin, there are three executive suites and 15 double cabins, 10 of which feature adjustable twin bed facilities. Special amenities include a fully-equipped gymnasium, health and beauty salon, and business centre. Perfect for an event charter due to her capacity to hold up to 300 guests at port, M/Y Lauren L is available for charter in the Caribbean as well as in less well-travelled destinations such as Brazil, Panama and Costa Rica. 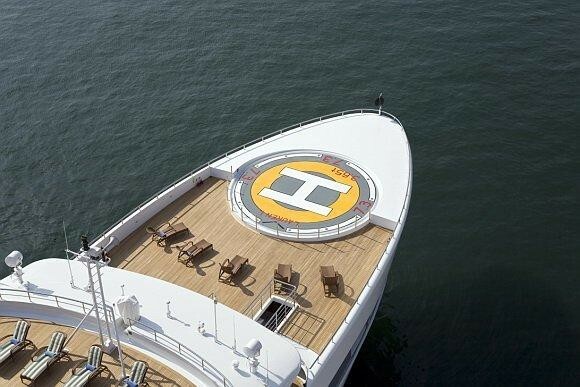 Luxury yacht Lauren L now features brighter, more contemporary spaces, which retain their grand, stately aura.